When donating by PayPal, please be sure to list the student you are supporting in the "notes" so we can give them credit! 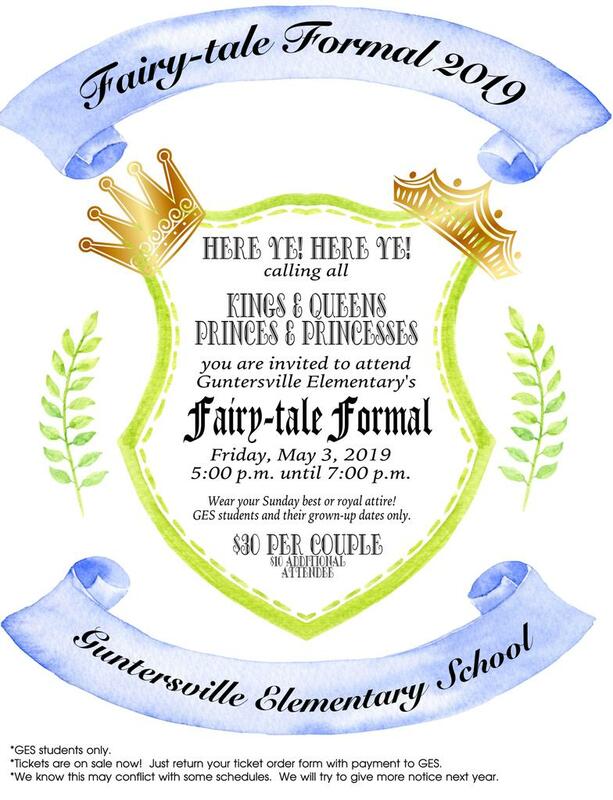 We are excited to announce our first GES Fairy-tale Formal, Friday, May 3, 2019. It is a special event for GES students and a special person in their lives. Students can invite a parent, grandparent, aunt/uncle or special grown-up to be their "date" for the event. We hope it is a fun time for all. Please watch for ticket order forms coming home soon! Guntersville Elementary is a Publix Partner! Our school will receive money from Publix every time you buy groceries at any Publix store. *Go online to sign up for a Publix.com account. * Log into your account, choose your name in green in the top left corner to go to your profile, then choose My Publix Partner and select Guntersville Elementary. Every time you shop at Publix, put in the phone number associated with your account and our school will get credit for your purchase! Easiest fundraiser ever! Ask all of your family to set it up too! * Please have your student practice buckling and unbuckling & opening and closing car doors so that they can LOAD and UNLOAD on the passenger side. We discourage parents from getting out of the car during car line. * Our lunchroom received a grant to provide "cost-free" breakfast for all students. We encourage all students to go to breakfast now! Students must be at school before the bell rings to visit breakfast. * Remember that to change transportation plans in ANY way, we must have your changes in writing. We cannot change transportation over the phone for safety reasons. * Please check your student's backpack and home folder every night. We have important information coming home regularly. *A Reminder About Check Outs: All checkouts before 11:00 a.m. count as a full-day absence. This is the case on any school day, including early dismissal days. Please make every effort to minimize checking in and out as students miss important instruction when they are absent. Excellent attendance is one of the best ways to help your child be a great student! Please see the letter below for news regarding our attendance policies. In the event of weather-related school closings or delays, we will make calls through our automated phone system, update websites and social media, and alert local news and radio. Please keep in mind that we are Guntersville City Schools and our plans are not always the same as the county system. We are excited to announce that Mr. John Doyle, our principal, has been named the Lake Guntersville Chamber of Commerce Educator of the Year for 2018. In remembrance of 911, our students spent the week thanking our local community helpers for their dedication to Guntersville! We are so proud of our boys and girls for thinking of others. It's the Wildcat Way! Visit our Facebook page to see more pictures from the week! Parents, We are in the middle of cold and flu season. Please be mindful of ways to reduce the spread of illnesses among students and staff. It is recommended that you keep your child home from school for any of the following symptoms: A Fever greater than 100 degrees (they should be fever free for 24 hours without any fever reducing medication), General feeling of fatigue/muscle aches/discomfort, Vomiting, or Coughing. Please notify your child's school nurse if your child stays home with these symptoms. Note things you can do to help prevent spreading illnesses: Frequent hand washing with soap/water; Cover your mouth/nose when coughing or sneezing; Do not share food/drinks. We are attaching an informational flyer from the CDC for your information. Thanks and have a great weekend. For additional information please click on the title of this article. The 2017-2018 results from the Alabama Unified Report Card were released earlier today. But, before providing any further information I want to share my appreciation for all the effort and hard work provided by our faculty and staff to support the students who are attending our schools. Please click on the Title above to see more. The Guntersville City Board of Education requires that all students enrolled in the city schools conduct themselves in a manner that facilitates the educational process. To insure that the educational process in the schools is not disrupted because of misbehavior on the part of enrolled students, the Board of Education has established specific classifications of misbehaviors and the appropriate disciplinary actions to deal with these violations of student conduct. The Guntersville City Board of Education is notifying the public that the Guntersville City Board of Education intends to award and enter into a Guaranteed Energy Cost Savings Contract with ABM, Inc. Please take the opportunity to view the Non-Resident Q&A form. Please check out the Flu Guide for Parents from the Centers for Disease Control.